In the first of our blogs from our nursing team Lead ENP Sue Bagley gives us an insight to a busy Sunday in the ED. 7am: It’s Sunday morning and the ED nursing team gather for handover. The festival is in full swing and the waiting room is half full of subdued party goers who really want to be home in bed waiting for their hangovers to begin. They hadn’t counted on a visit to the ED being part of their festival experience. My first patient is a pleasant surprise. I go into the waiting room and call his name, glancing around to see which of the sleeping forms sprawled across the seats will rouse themselves. Instead, a young – sober ̶ guy dressed in a slightly crumpled suit walks briskly towards me with a smile. He politely brushes off my apology for the wait and explains he is the manager of a night club and has been head-butted by a drunk patron. He’s got a laceration to his upper lip which will need careful closure to ensure a good cosmetic result. It’s a very visible area and crosses the vermillion border- the edge of the lip where it meets the skin. If it’s not closed with a perfect join it will be obvious for the rest of his life. With half an eye on the clock, I set to work. It’s important to get it right. Ten minutes later, he is on his way home. Two of my nurse practitioner colleagues are working away at the queue and we are well on our way to clearing the waiting room of last nights’ customers. However, I see a queue of new patients forming at the desk already. My next patient is one of the party goers from last night. He got into a fight after too many beers at his stag party and has a nasty wound to his eyebrow. In addition, he can’t really remember what happened to him. I have to assess him very carefully to ensure he doesn’t have any signs of a more serious head injury, or any other injuries. Alcohol makes this task so much more difficult. A short time later, after a top-to-toe assessment and a discussion with one of the senior doctors on duty, he is on his way home too, accompanied by a quietly wrathful fiancé. The receptionist brings my attention to a patient who has just booked in. Enid is 93 years old and tripped over last night whilst walking her dog. She has a nasty fracture to her left wrist, but didn’t want to call her son at such a late hour. She has spent a very uncomfortable night on her own at home. She is quickly ‘triaged up’ to the top of the queue, given some pain relief and sent for an X-ray. 0845: The ED Huddle. A representative from every staff group gathers for a few minutes to touch base- a nurse, consultant, receptionist, porter, physio, radiographer. We make sure any issues or potential problems for the shift are flagged up. There are a few ‘bed waits’ in the department (patients whose ED assessment and treatment are complete but who are awaiting their admission to the main hospital), they require the attention of at least one of our staff nurses for their ongoing care, but the nurse in charge is hopeful their beds will come up soon. I get back to ‘Exam’ and we organise breaks between us. ‘Exam’ is short for ‘Examination Room’ and is our Minor Injuries area. Minor Injuries is a bit of a misnomer, however, as we see patients who are not really injured, and their complaints are certainly not minor. My next patient is a good example of this. Frank has had sciatica for several weeks and has been treated by his GP with a combination of drugs and is waiting for an MRI. His pain has got worse over the weekend and he is concerned that he has had a couple of episodes of urinary incontinence. I take a history and perform a full neurological examination. He has some weakness in his left leg and some paraesthesia. I discuss my findings with the ED Consultant and we decide to speak to the neurosurgeon on call. They are also concerned he may have symptoms of Cauda Equina syndrome (an emergency situation when the bottom of the spinal cord is squashed leading to potentially irreversible damage) and ask me to organise an urgent MRI scan before we send him over to the Western General for review. Frank is going to be here for a while. Enid is back from her x ray and it confirms what we suspected- she has a Colle’s fracture. I put her arm in a cast and book her in for a Bier’s block procedure and fracture manipulation tomorrow. Her son is happy to take her home and keep an eye on her tonight. After lunch, I’m in the triage team. 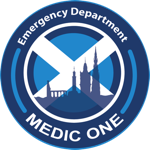 Our relatively new One Patient Pathway is a multidisciplinary triage team who meet patients as they arrive. The aim is to provide a ‘work up’, where necessary investigations are initiated within the first twenty minutes or so of arrival. It also gives us the opportunity to ensure patients are directed to the most appropriate place, whether that is straight through to one of the clinical areas, direct to a hospital speciality or even back home to their GP. As an ENP, I concentrate on triaging the minors flow. Approximately 50% of our patients are seen in Exam, which is around 150-175 patients per day. There is a particular skill to triage as an ENP, because the temptation to get involved with every patient is great. It’s important to keep the flow of triage going, so the queue doesn’t build up too much and the wait for triage increases. The value of having a clinical decision maker performing an assessment as people arrive is that we can anticipate the patient’s journey and instigate diagnostic investigations which save time later on, but we are also able to ‘see and treat’ very minor presentations, or reassure patients they are able to wait for an appointment with their GP rather than come to the Emergency Department. It’s non-stop though, as during busy periods we can get 10-20 patients arriving per hour. I keep an eye on the time to triage and when the queue begins to grow I seek help from another ENP and a staff nurse for a short time until everyone has had their triage assessment. It’s a balancing act, watching the computer screen constantly, to ensure we are keeping up with the numbers of patients presenting. As triage ENP for the afternoon, this is one of my responsibilities. 5:30pm: It’s nearly the end of my shift, but it’s beginning to get busy again. There are a lot of people in triage who have finished work and decided to pop in to get their sore ankle/wrist/finger that’s been bothering them all week checked out. A lot of what we do in minors triage is reassurance and education, making sure our patients know when they need to come to the Emergency Department and when they don’t.